Hello Doodlebugs! It's Mendi here today. With Christmas behind us, I am excited to switch gears and prepare for Valentine's Day! Doodlebug's newest Lovebugs collection was perfect for documenting photos of my girls from last year. I wanted to find a way to show off some of my favorite prints from the collection and pick up the colors in my photos so I cut out five slightly different shaped hearts ranging in size from 1.25" to 1.5" from five sheets of 6x6 paper. For the center I layered Doodlebug's sweet new red heart vellum and created my title with a mixture of lily white Chippers & Love Letters alphabet stickers. After struggling to find the perfect finishing touch to balance out my page along the bottom, I had the idea to create a homemade bow from washi tape. It was super easy to create and I have broken it down for you to make some of your own in a few easy steps. Step 1: Cut an 8-inch strip of washi tape and fold it in half onto itself, making sure to line up the polka-dots. You should now have a 4-inch strip with no stickiness revealed. Step 2: Fold it again, overlapping the the loose ends on the center back. Using a little bit of thread Tie several knots around the center to help scrunch it up. Step 3: Cut another small 2-inch piece of the tape and folded it lengthwise to form the center of bow. Wrap it around the center of your bow several times and secured it on the back with a glue dot. Precious layout as always Mendi .... and I LOVE the washi bow!! 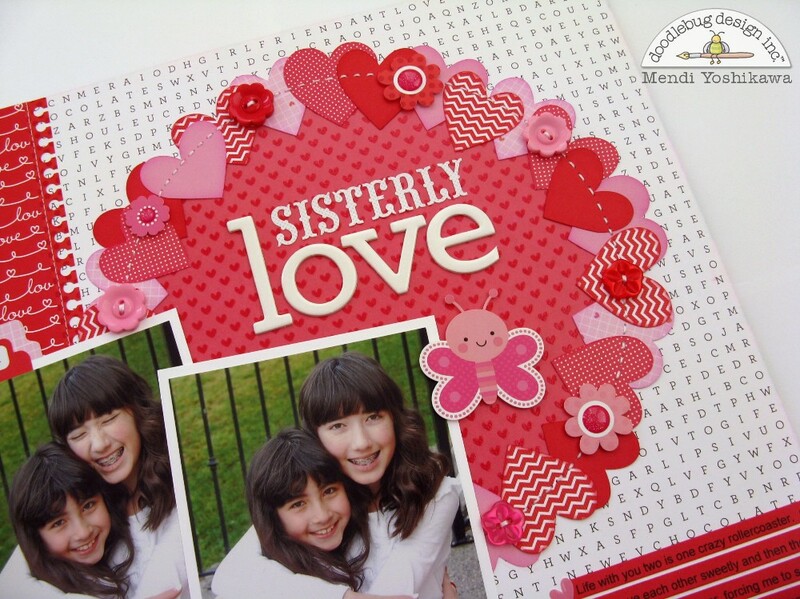 What an adorable layout Mendi! I think this new Lovebugs collections is totally darling!! Your washi bow is SO super sweet and I can't wait to try one of my own thanks to your great inspiration!!! So cute!! Love that washi bow! Such an adorable layout, love the circle of hearts and the stitching around it! The washi bow is absolutely fabulous! Fun colors in this collections and I just love the embellishments! Mendi is one of my crafting heroes - everything she does looks so good - what inspiration she is to me as she creates with my absolute favorite company - Doodlebug Design!!! What you all do is just fantastic!! Thanks Mendi for creating such awesome projects and thanks Doodlebug & Cynthea for the amazing items and products to create with!!! 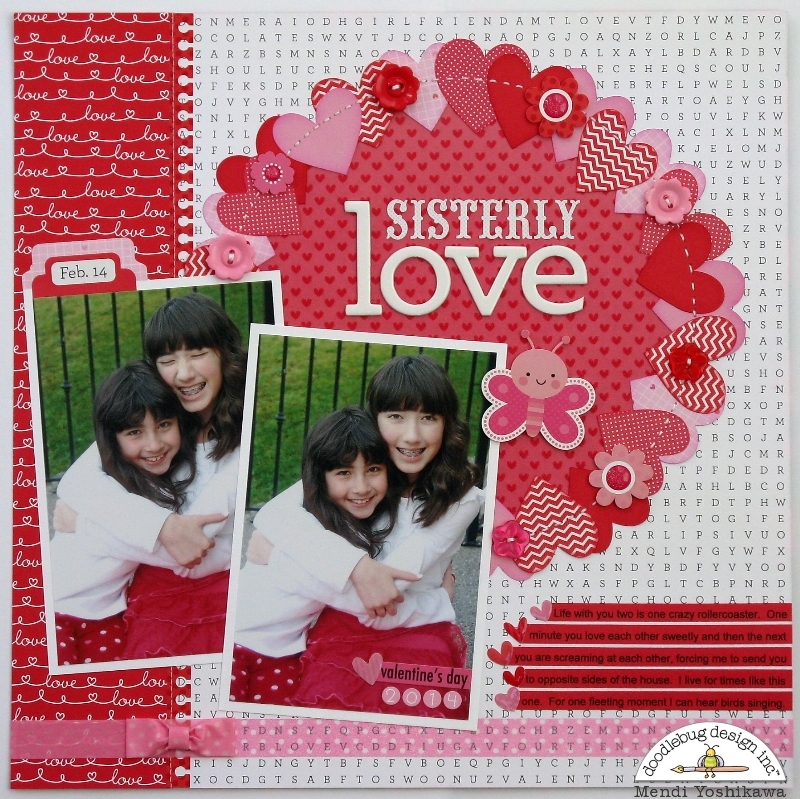 LOVELY photos and DELIGHTFUL layout Mendi - LOVE IT!!! OMG Your LO is definitely Fabulous and oh so Fun!! Your girls are both so beautiful and love that they have fun together and act silly for photos this is my favorite kind of photo too as I am a die hard scrapper since 2004 and takes tons of pics so I know how much fun you had scrapping your LO and girl you are one talented scrapper too....love all your paper and embellishments. You definitely scrap with passion!! YOU so ROCK!! Love your layout and really crazy about the "sisterly" font letters! 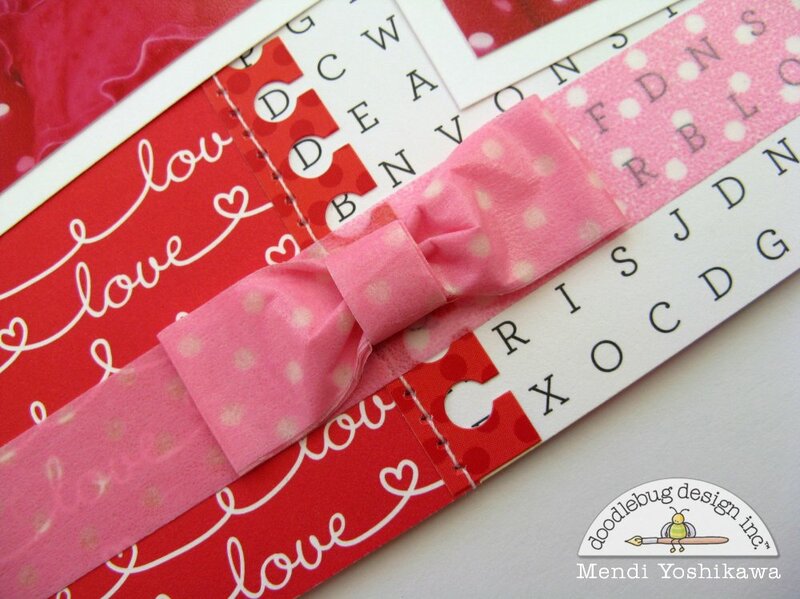 Gorgeous, Mendi, and love the washi tape bow! I love the washi bows ... I can't wait to try it !! !